What is the Elephant Trunk Hill? As a main landmark of Guilin, Elephant Trunk Hill stands at the intersection of the Peach Blossom River and the Li River. It looks like a large elephant drinking water in the river. There is a round hole with an area of around 150 square meters. The hill is a combination of old buildings and nature. 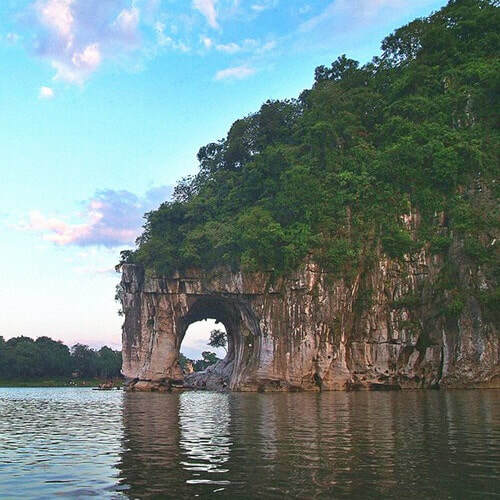 Elephant Trunk Hill features the Water and Moon Hole, the Sunrise Pavilion, the Cave of Elephant’s Eye, Puxian Pagoda, Yunfeng Temple, and a stupa to explore. Originally built in the early Ming Dynasty (1368 - 1644), Puxian Pagoda is 13.6 meters tall. It looks like a precious bottle or a handle of a sword sticking in the back of the Elephant Trunk Hill. The Water and Moon Hole is located between the trunk of and the leg of the elephant. You will find tens of old stone inscriptions on the wall of the hole. With a width of between 5 and 10 meters, the Cave of the Elephant’s Eye is some 52.8 meters long, and 2 meters tall. The cave is situated next to the Water and Moon Hole. As a former command post of the Taiping Heavenly Kingdom (1851-1864), Yunfeng Temple was the former residence of the late pioneer of the Japanese Buddhism – Monk Jianzheng. He lived in the temple for some one year. ​Nowadays, the temple is the exhibition of the Taiping Heavenly Kingdom. You could see battle flags, weapons and shells used during the period in the temple. If interested, you also could visit Guilin Sanhua Xiangshan Wine Cellar in one cave of the hill. The best time to visit Elephant Trunk Hill is in the morning. The best months to visit are from April to October. A few buses pass by the hill. Therefore, there are a few options. Rent a vehicle to the hill. This is the quickest and most direct option. Take Bus 2, 16, 23, and Bus 88 to the Stop of Xiangshan Gongyuan (象山公园站). Please take care of yourself when walk on the hill. Interested in visiting Elephant Trunk Hill on a Tour? Wendy Wei Tours offers a variety of different packaged tours as well as custom tours including Elephant Trunk Hill, among other attractions and destinations. To find out more, please visit our Tours page or Contact Us directly to find out more.